Wendi's Book Corner ~ Rainy Day Reads (And More) In Seattle Wendi's Book Corner: Guest Post: H. Terrell Griffin, Author of Blood Island: A Matt Royal Mystery PLUS Details on Signed Book Giveaway! Guest Post: H. Terrell Griffin, Author of Blood Island: A Matt Royal Mystery PLUS Details on Signed Book Giveaway! Today, it is my pleasure to welcome H. Terrell Griffin, author of Blood Island: A Matt Royal Mystery, as a guest blogger as part of a book tour coordinated by Lance with Hidden Staircase Mystery Books. I have the great good fortune to spend much of my time on Longboat Key, an island off the west coast of Florida, south of Tampa Bay. The key is small, about ten miles long and a quarter-mile wide. It is peopled with some of the most fascinating characters I have ever met; a mélange of retirees, working people, waiters and waitresses, and fully employed folks who are lawyers, physicians, stock brokers, business executives, salespeople, and assorted others who travel daily to the mainland for work. Longboat Key is a veritable cornucopia of bartenders of every stripe, men and women, gays and straights, young and old, Florida natives and refugees form colder climes, black and white and Hispanic and Caribbean, and even a Canadian. These are the keepers of the island secrets, the ones who know the people who come to live or visit in our paradise; the ones who know who is real and who isn’t. There are a lot of stories on the island, some real, some made up, and some that fall in between. People come to Longboat to start over. Many were successful in their earlier lives and retired to the quiet and sun and sea that is our key. Others, not successful or worse, came to the key and reinvented themselves and their past. One does not scratch too far below the surface of our residents for fear that one will find a lie, or a truth that would be better hidden to us all. The key is a boiling pot of fodder for the writer. He hears the stories as he visits the bars that make the island human, that bring together the disparate characters who make it home or who visit regularly. He takes mental notes and turns the reality, or what passes for reality to the teller of the story, into fiction. He peoples his books with the characters that he meets daily on this vulnerable and small spit of sand that rests uneasily on the shores of a great sea that sometimes brings hurricanes that ravage the people and the land. The key is a place with little crime, so the writer has to invent it, move some of the mainland crime to the island, bring in bad guys who are, in reality, not tolerated on our island. The key is the setting of my books, my home and the place I love best in the world. I hope I do it justice in my scribbling. I invite you to join me there, in reality or in my books. I think you’ll fall in love with it, too. H. Terrell Griffin is the author of Blood Island, the third mystery in the Matt Royal series. Born in Waycross, Georgia, H. Terrell Griffin moved to Sanford, Florida, at the age of twelve. Upon graduation from high school, he enlisted in the U.S. Army. After three years of active duty, he began his studies at Mercer University in Macon, Georgia, where he earned degrees in history and law. A board-certified trial lawyer, Griffin practiced law in Orlando for 38 years. 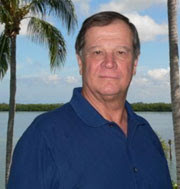 In addition to Blood Island, Griffin is the author of Murder Key and Longboat Blues. He and his wife Jean divide their time between Longboat Key and Maitland, Florida. His website is HTerrellGriffin.com. What’s happening on this island will make your blood run cold. Matt Royal never has to look far for excitement. Excitement–and sometimes trouble–has a way of finding him first. But for this fun-loving lawyer turned beach bum, things are about to get serious. Dead serious. 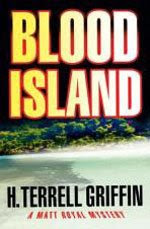 H. Terrell Griffin is giving away a signed copy of his book, Blood Island, to one lucky tour visitor. Go to Terry’s book tour page, http://h-terrell-griffin.omnimystery.com/, and enter your name, e-mail address, and this PIN, 7226, for your chance to win. Entries from this blog site will be accepted until 12:00 Noon (PT) tomorrow. No purchase is required to enter or to win. The winner (first name only) will be announced on Terry’s book tour page next week. For more entries, go to each of the blogs participating in the tour and enter again using the PIN from their sites! You can get up to 10 entries!! Good luck!! I loved the book and cannot wait to read more Matt Royal mysteries. It was such a fun read --- just what I needed! Thanks for sharing. I've been following this book tour all week. I love the format - especially the PIN. Interesting post(s) by the author. I have been following the tour as well and there have been several good stops. Each stop offers something a little different - not just a cookie cutter post.